I know I’m late to the party on this one, but Kaleena Mosqueda-Lewis could be the best freshman on the Connecticut campus (sorry Andre Drummond). 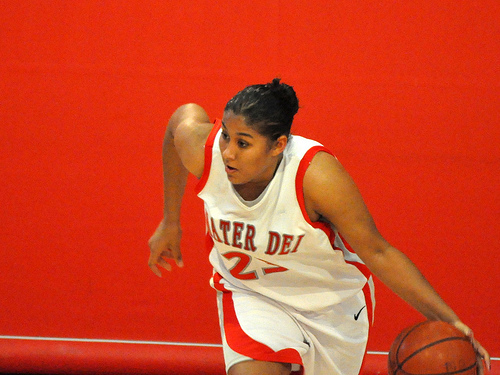 Mosqueda-Lewis is averaging a team-high 15.5 PPG this season. She was the top female high school player last year and has been critical in filling some of the offensive production left behind by Maya Moore. The 6-foot tall California native is thriving in her role off the bench, dropping game-high 25 points in a big time win over No. 3 Stanford. Mosqueda-Lewis is on a stacked UConn team (as always) and she should be a name you hear about for years to come. Wouldn’t be shocked at all if she helped head coach Geno Auriemma raise some banners from now until her expected graduation date in 2015.